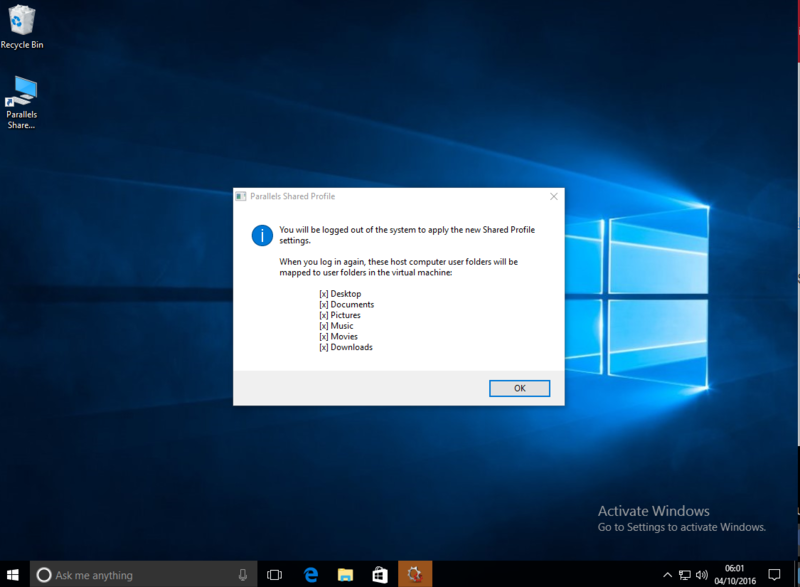 Parallels Shared Profile notification pops up every time Windows virtual machine starts. Download sp_correct.reg. Save it inside Windows virtual machine in the location where you would easily find it. Double click on the sp_correct.reg and apply registry changes. Restart your Windows virtual machine. Go to your Virtual Machine's Configuration > Security > disable Isolate Windows from Mac option. Start your Virtual Machine, Start menu > Control Panel > Programs and Features and uninstall Parallels Tools. Once Parallels Tools are removed, reboot Windows and install Parallels Tools. Repeat step 2, but enable Isolate Windows from Mac option this time. Go to C:\Program Files (x86)\Parallels\Parallels Tools\Plugins and delete SharedProfile.dll file. Create a new folder inside of Plugins folder and move SharedProfile.dll file to it. Press OK on the pop up message to relogin.